Acer palmatum 'Osakazuki' photographed in November and Anopterus glandulosus photographed in December. Anopterus glandulosus from Tasmanium woodlands survived - 7º C in the 2000/2001 winter and produced beautiful spikes of pure white terminal flowers in December 2001. Although reputed to be rather fastidious, this young plant is growing well at Earlscliffe in an open, sunny situation exposed to south easterly wind without any sign of low temperature or wind injury. After a good growing season, the autumn was relatively frost free, moist, calm and warm. 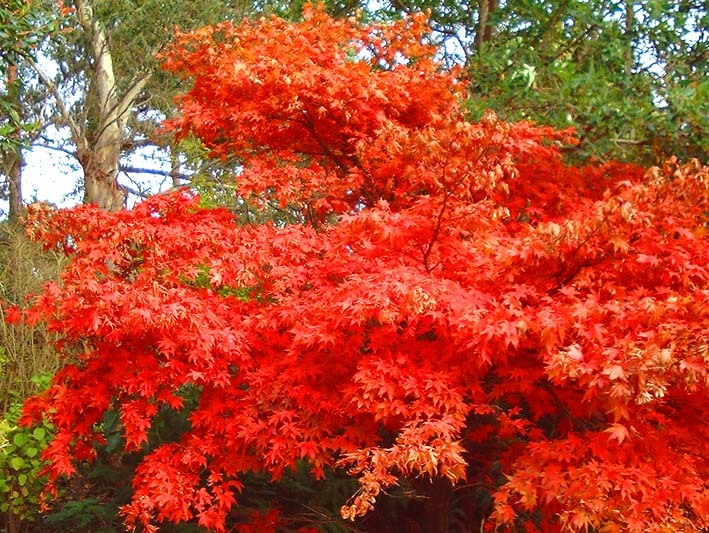 Conditions were ideal for autumn colour and many genera, such as Magnolia, Betula and Gingko, gave exceptionally colourful displays. Most flamboyant of all was Acer palmatum septemlobum 'Osakazuki', photographed on November 18, 2001, with its brilliant vivid scarlet leaves which lasted for several weeks. .
Fascicularia bicolor, from central and southern Chile, makes a long lasting show in the autumn when the base of the leaves surrounding the blue flowers turns a bright crimson. This Bromeliad is exceptionally hardy under conditions here and has never shown any signs of winter injury since first planted 32 years ago. The plant is easy to propagate as offsets pushed into the soil root readily. Aloysia citriodora, Lemon Verbena (formerly Lippia citriodora) is a late starter. It confuses many people by appearing dead until late spring but then once it gets going it continues to grow and flowers profusely into late autumn. The flowers are small, white and not very conspicuous, but the plant's claim to flame is not its flowers or architectural beauty but the intense fragrance of its leaves. 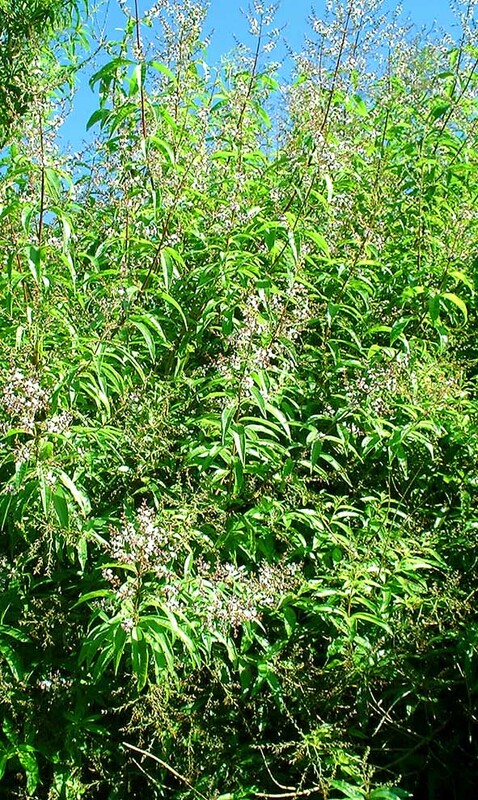 Although often used as bedding, this Aloysia is now a tree 4 metres high, growing strongly and has more strongly scented foliage than any other plant in the garden. Ochagavia carnea, a typical bromeliad from the coastal area of central Chile, helps to brighten up the autumn garden with its large inflorescence of bright rose pink flowers. 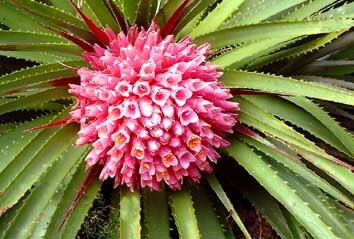 According to the New Royal Horticultural Society Dictionary of Gardening, Ochagavia carnea is a Climatic Zone 10 plant. This clearly needs modification to Climatic Zone 9 in the next edition for many plants in different part of the garden have withstood - 7º C in the 2000/01 winter and a slightly lower temperature in 1995/96 without the slightest sign of injury. 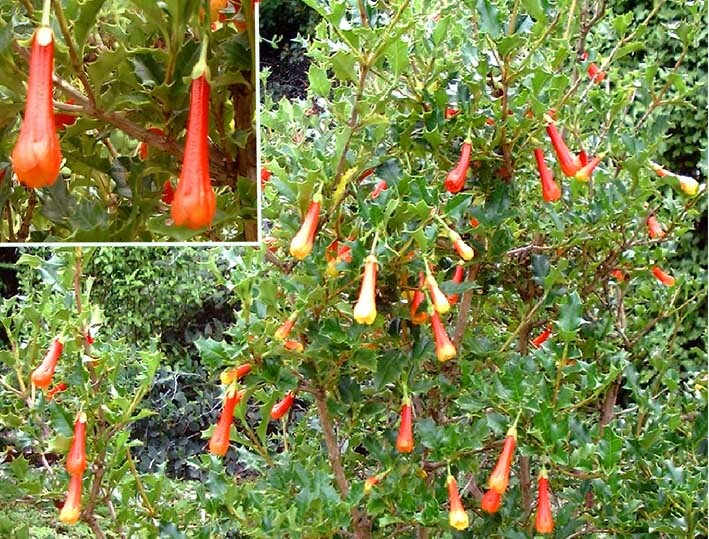 Desfontainia spinosa is a native of the Andes from Colombia to the Straits of Magellan. It has holly-like evergreen foliage and tubular flowers. These may be scarlet with a yellow tip or all scarlet as in the inset. The plant is reputed to grow better in Scotland and Northern Ireland than in the south west of England and to need constant shade at the roots. This specimen is growing in an open situation without shade at the roots but being near the sea it is seldom exposed to temperatures in excess of 23 degrees C. The plant is a survivor having been run over twice by a tractor in the course of building operations with no lasting damage. It also came through the severe 2000/01 winter without injury. A six year old plant of Olearia 'Henry Travers'. This plant was introduced to Ireland as O. semidentata in 1908 but is now believed to be a hybrid between O. semidentata and the coarser O.chathamica. 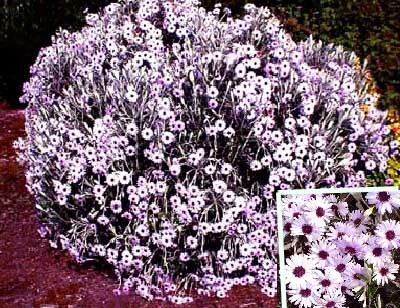 Olearia 'Henry Travers' , with its pale purple ray florets and dark purple disc florets is the most beautiful Olearia that grows here. 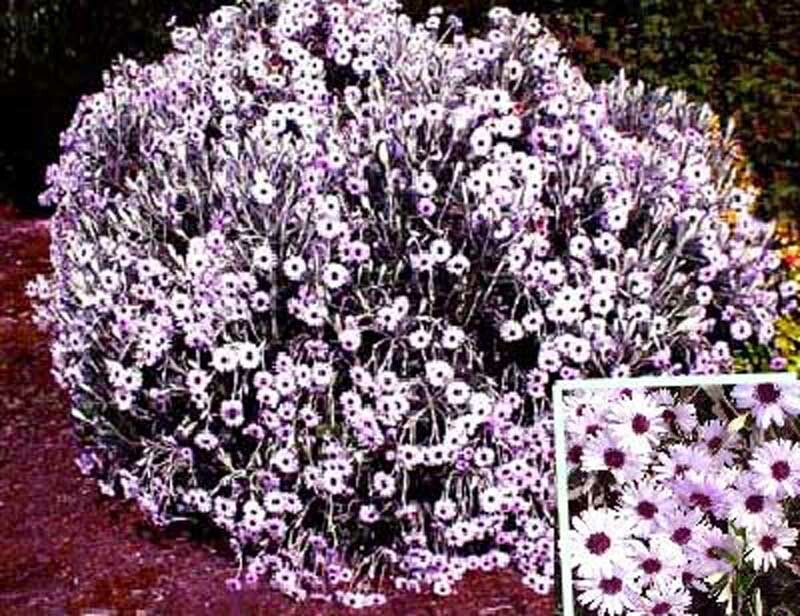 The flowers become larger and paler with age. This plant is growing near the sea and is fully exposed to south easterly gales. It has never been fed, watered or pruned. Pampered plants flower poorly and often die an early death. Plants given benign neglect can live for over 30 years and grow to a height of 3.5 - 4 metres. 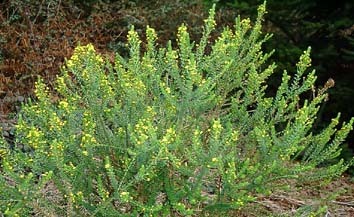 Erica pageana is one of very few yellow flowered species of heather. It normally flowers in April but is late this year on account of the severe winter. It is fairly resistant to low temperatures but appears to be sensitive to summer drought. In its native South Africa it occurs naturally in marshy places. 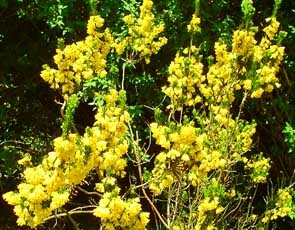 Erica pageana is worth growing here for its intensely bright yellow flowers and for its slight fragrance, but its scent may not appeal to everybody. Not normally a long lived plant, this specimen is not over 10 years old and is probably getting towards the end of its natural life. 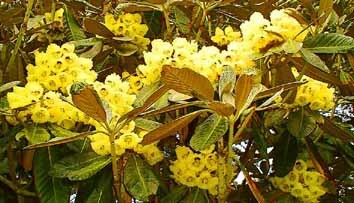 This specimen of Rhododendron macabeanum x sinogrande is a natural hybrid from the island of Ilnacullin, West Cork. Planted as a seedling in 1975, it has now formed a small tree about 5.5 metres high and is the largest rhododendron at Earlscliffe. The vigorous growth is surprising as our average rainfall is only 660 mm and no additional water is provided. The plant is probably favoured by the low summer temperature which seldom exceeds 23° C. R. macabeanum x sinogrande is attractive all year with its striking large, leathery leaves and its huge trusses of yellow flowers in April and May. Despite the harsh winter, the plant has flowered well this spring although much later than normal. Camellia 'Inspiration' (C. reticulata wild form x C. saluensis) and other Camellia varieties are helping to bring back some bright colour to a garden set back by the harshest winter in at least 31 years. 'Inspiration' is selected as the Plant for April because the flowers are more weather proof than 12 other varieties grown. In almost every year 'Inspiration' will open its first flowers between Christmas Day and New Year's Eve and flowering continues until mid-May. 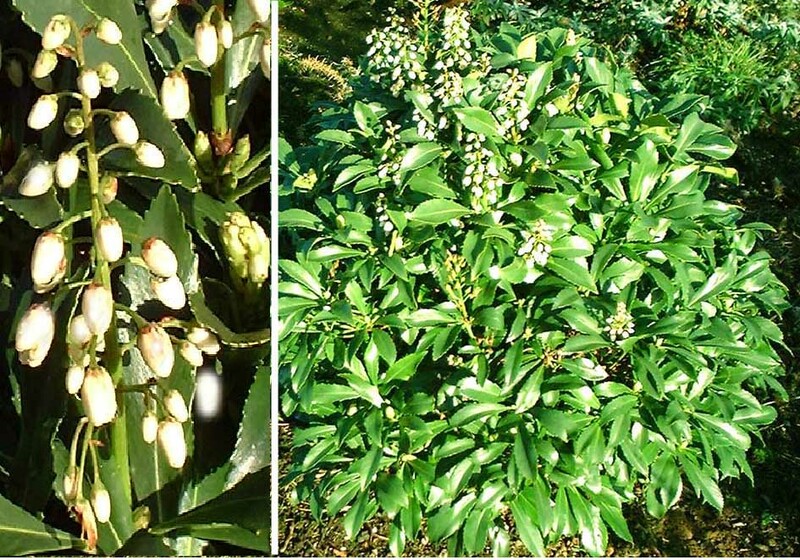 Flowering has been delayed this season because of the cold winter. In the meantime, many of the Zone 9 plants that have been severely damaged by low temperatures and appeared dead until late March, such as Sonchus arboreus and Tetrapanax papyrifer, are beginning to show signs of recovery. Euryops virgineus from South Africa is selected this month, not because of it flamboyance but because it has flowered continuously from before Christmas to well into March (at least), through the most severe spell of weather since records began here in 1969. 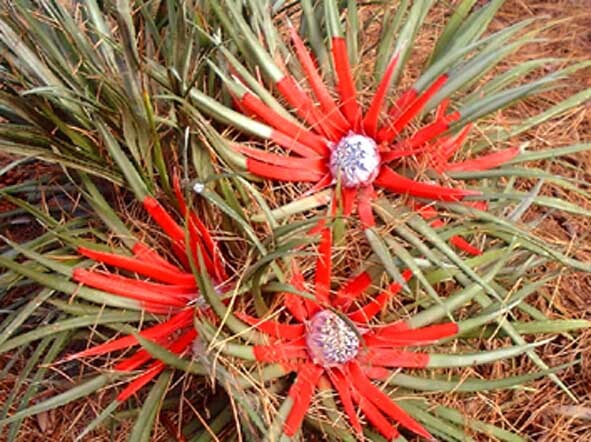 The plant in an open, unprotected situation has survived temperatures as low as -7º C without damage. Rated as Climatic Zone 9, Euryops virgineus has come through the winter in better condition than E.pectinatus (rated Zone 8) which was slightly damaged and also E. chrysanthemoides (rated Zone 9) which appears at present to have been killed by the low temperature between December 26 and 30, 2000. 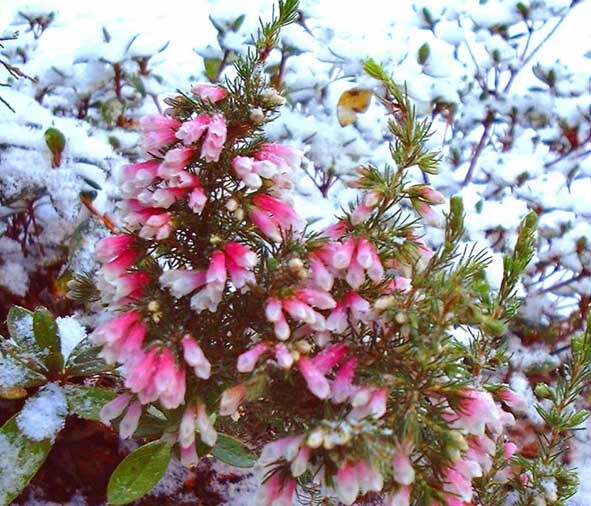 As expected the recent spell of severe weather killed many of the most tender plants in the garden including Erica x hiemalis, the heather selected as plant of the month for January 2001. 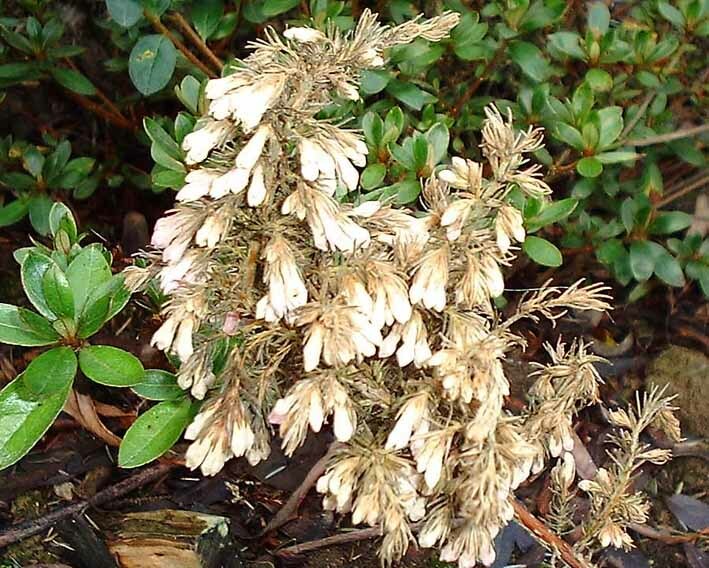 The same plant in its moribund condition has been selected for February 2001 as a memento mori and in memory of the many other plants that have died at the same time. These include Aeonium tabuliforme, Aloe arborescens, Erica doliiformis, Psoralea affinis and many others. This cold spell is a benefit rather than a disadvantage as it provides useful information on plant hardiness and also on the extent to which many apparently dead plants such as Brugmansia sanguinea and Metrosideros excelsus will recover. At least one plant, listed as Climatic Zone 10 (Tropical) in the New RHS Dictionary of Gardening, Tetraclinis articulata has survived apparently unscathed. Big differences in low temperature tolerance of species within genera such as Agave and Aloe are already obvious and will be recorded later in the year. Many interesting plants including the palm Juania australis and Protea species have survived to provide continuing interest in the garden. Erica x hiemalis flowering during an exceptionally cold spell (down to -7°C) just before New Year's Day 2001. This is an ill defined species of unknown origin. 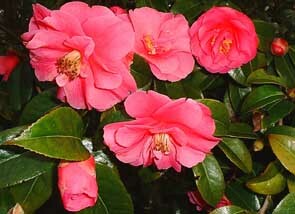 The name is often given to collate hybrids raised in Britain, France and Germany. Erica x hiemalis produces racemes of rose tinted flowers in mid-winter and brings a touch of colour to the garden in December/January. The weather in the last week in December 2000 has surpassed all previous records for low temperatures, with -6, -4, -7 and - 5.5°C being recorded on successive nights from the 26th to the 29th. It is inevitable that there will be considerable loss of more tender (Zone 9) plants in the early months of 2001.